Yep, they’re out there, 70 miles from Key West…the wrong way! In the 1500s Ponce de Leon named this cluster of seven islands the “Tortugas,” acknowledging their abundant sea turtle population. “Dry” was sagely added to warn of a lack of fresh water. 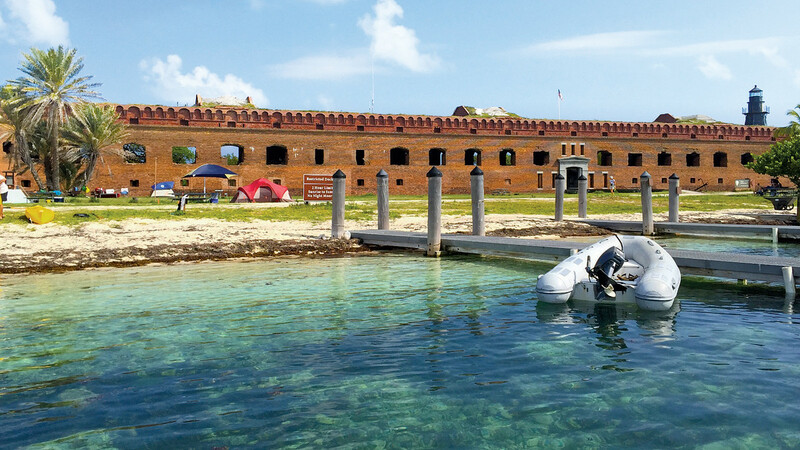 Preserved as Dry Tortugas National Park, this outpost’s heyday was during the Civil War, but Fort Jefferson is still maintained, boasting a hexagonal citadel rising on an otherwise empty Gulf of Mexico horizon. For intrepid sailors, this remote destination can be a once in a lifetime experience, or an engaging layover en route to Cuba, Mexico or Central America. Weather is key to a safe and enjoyable visit because the transit and anchorage are both exposed. Choose a slow-moving, high-pressure system with a week or two of predicted calm. Then monitor the weather once you’re there, adjusting your planned return date if necessary. Trust us, we know. In 2002, we were forced to bail early in deteriorating conditions, worried we would miss our own Key West wedding! There are two routes from Key West, one running north of the Marquesas Keys, Half-Moon Shoal and Rebecca Shoal, and the other going to the south. Both routes are equidistant, easy to navigate and provide complementary protection. Taking advantage of prevailing wind patterns, the south route is preferred outbound, departing Key West at the calm of dawn, then leveraging any building winds and seas over the last third of open water for a downhill spinnaker finish. The north route makes for a better return, covering the exposed first third in the morning in calm winds and seas, then as conditions build, benefiting from the protection of the Marquesas. Many sailors also opt to break up the longish transit or extend their itinerary by anchoring at one of the south route’s fair-weather shoal anchorages, such as Woman Key, Boca Grande or Marquesas Keys. Services at the Dry Tortugas are nonexistent, so be sure your water tanks, fuel tanks and larder are full. Don’t be afraid to over-provision in case your return is delayed by unexpected weather. There is no VHF, cell or internet service, but rangers post NOAA weather info daily at the visitor center. The main island, Garden Key, and the more remote Loggerhead Key have rangers in-residence. You won’t need to obtain a visitor permit in advance, simply dinghy ashore when you arrive to check in for your park pass and obtain QR-scan brochures on the park’s rules and activities. 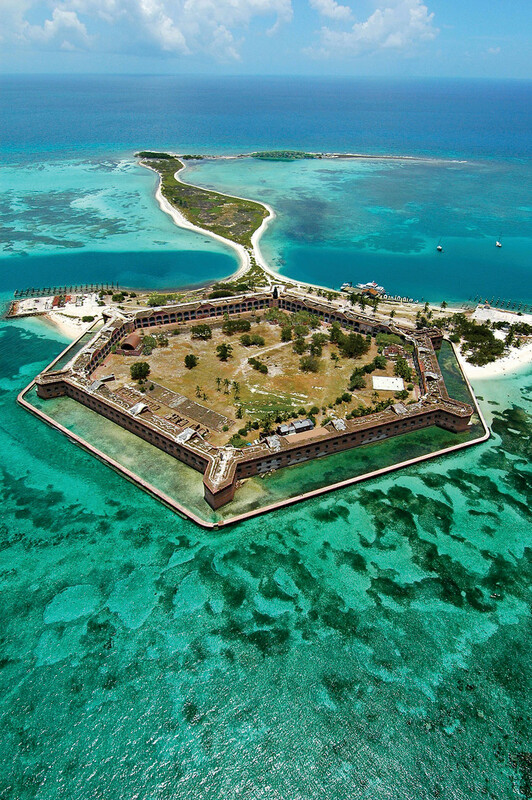 The Fort Jefferson main anchorage (South) is large and accommodates many boats. At first assessment— with no land to the east, southeast or south—the anchorage feels exposed and unprotected. However, a shallow reef completely surrounds it, protecting vessels from waves, if not the wind. The bottom is marl, so use your big-boy anchor and a lot of chain to prevent dragging during high, sustained winds. Despite the fact that they are, quite literally, in the middle of nowhere, there is plenty to do in the Dry Tortugas. Key West day-trippers arrive by either high-speed ferry or seaplane from mid-morning to early afternoon, to swim, snorkel, kayak, explore the historic fort, camp or watch the wildlife (ranging from sharks and rays to sea turtles, a nesting colony of frigate birds and sooty terns). Thus, “visiting hours” are a good time to nap, read or do boat projects, although lunchtime and the ferry remain an important part of your daily Dry Tortugas routine, providing a fairly high-end but nominally-priced lunch buffet, ice-cold drinks, clean heads, garbage drop-off and freshwater showers! Ultimately, the real rewards of visiting come during the mornings and evenings, before or after the ferry and seaplanes come around, when the island transforms. You are now “inside the attraction, outside operating hours,” in a quiet haven for the anchored sailboats and tent campers. The fort and island are yours to explore, walking the moat, climbing the towers or watching the sunset. And what a sunset! Sitting in our cockpit with the silhouette of Fort Jefferson and the sun setting over the Gulf of Mexico, was the first time we witnessed the elusive green flash!